For most families, the kitchen is the heart of the home. Needless to say, we like to take pride in its appearance. On average, most people budget between $25,001 and $50,000 to update their kitchen. You want to ensure everything is exactly how you want it. This is why we’ve put together a mini guide on the latest kitchen cabinet trends. Hopefully, this will help steer you in the right direction! If you’re thinking of redecorating, you should check out these kitchen cabinet trends. Without further ado, let’s dive on in. 1. You Can’t Go Wrong with a White Cabinet, but Grey is Nice! If you’re considering buying new kitchen cabinets the safe bet is always white. Everything matches whites, and resell always likes a white. This is true when I started and even now. Pick up any decorating magazine and you’ll see over half the kitchens are white….and that’s true year after year. Or you could try adding kitchen storage that’s larger than expected for the kitchen space. Using either of these methods is an excellent way to add depth to a room, especially if the kitchen has a low ceiling. There’s nothing worse than a cluttered kitchen. Not only is this an eyesore, but it it’s also a health hazard. Running around with hot pots and pans with nowhere to put them down is an accident waiting to happen. With that in mind, choose kitchen cabinets that prioritize storage. By this, we mean deep drawers and multi-tiered cabinets. This is the perfect solution to stashing away all of your kitchen accessories. For higher end kitchens, Quartz is still number one. Granite is great, but Quartz comes in countless colours so you can find a style that will suit just about any design. While Quartz used to have more of a speckled or repeating pattern (called particulates), new technology has allowed manufacturers to add realistic stone patterns like elaborate swirls or veining. Plus, quartz is so popular (and will remain that way for a while) because it is non-porous, is practically maintenance free. As for sinks, the stainless steel undermount will always be king, but the composites (black, grey, white) are becoming quite trendy. Be warned: from my experience, the composites stain very easily and begin to look aged quickly. Remember the golden oak raised panel? Of course you do. Maybe that’s your kitchen now. Now, the look is trending toward whites and greys, with an eye for sleek and timeless. For cabinetry, we’re looking at a panel door, more specifically the shaker. What is a panel door? A shaker style cabinet is characterized by a five-piece door with a recessed center panel. Some shaker cabinets are very clean and simple, while others have decorative edge detailing. For backsplash, there’s the timeless subway tile (though they come in various colours other than the typical white). Then instead of knobs there’s the bar pull. Did You Enjoy This Blog Post on Kitchen Cabinet Trends? 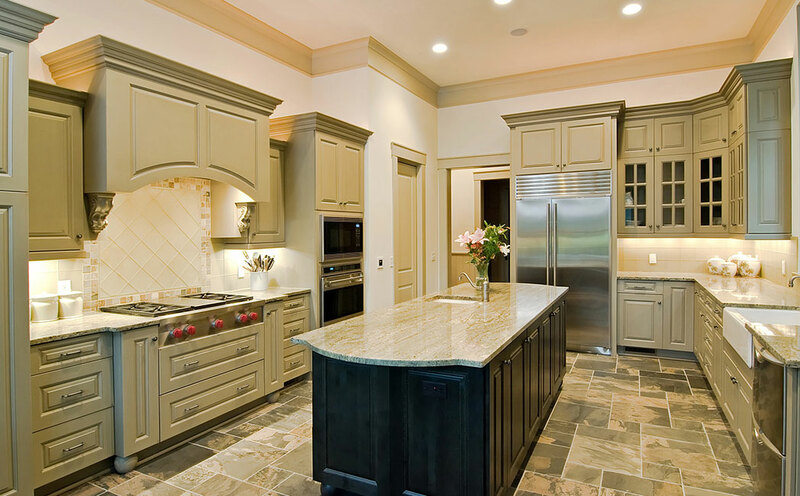 If you’ve enjoyed this article on kitchen cabinet trends, then check out our services page. Over there, we explain everything you need to know about cabinet resurfacing and how it can help to liven up your kitchen. Also, please feel free to drop us a line with any questions you have, and we’ll be more than happy to help. Speak soon!